Heated Itch Relief | OhGizmo! Holy Safety Innovation Batman! It’s The Rescue Reel! I don’t remember the last time I’ve had a mosquito bite, but I do remember them being extremely annoying, though somewhat satisfying to scratch. 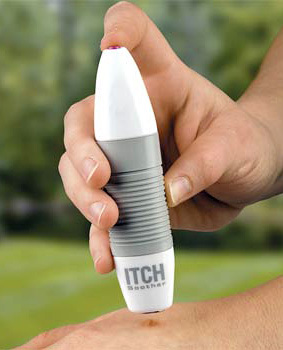 But it turns out scratching could lead to infections, so the only options are to grin and bear it, or carry around this Heated Itch Relief device whenever you head outside. You’re supposed to press the head of the device onto the bite and hold it for a few seconds, during which a heating element “helps neutralize the insect-injected proteins that cause itching and swelling.” The Heated itch Relief is also described as pocket-sized, though looking at that pic it seems a bit on the large side for something you’d actually want sitting in your pocket all day. But for just $16.99 if you live in a swamp, bayou, bog or near a large pool of standing water, it might just replace sliced bread as being the greatest thing.